Why a MASTER TO DO LIST works best - and what it is! Over the years I have come to find a really great system for TO DO lists that works for me, and in that system (the key to it), is a MASTER TO DO LIST. WHAT EXACTLY IS A MASTER TO DO LIST? A MASTER TO DO list is basically a list of all tasks that need to be done by you at some point in the future. It is one list for EVERYTHING – whether it be related to your work life, home life, social life or anything else…. It is categorised and put into an order (main task and mini tasks needed to complete the main task) that means you know where you are on any given task at any given point – and each task is something that can be done within any given day. It is somewhere that you can go to see what needs doing next when you have time in your schedule. It will keep you focused on what’s important, give you a great overview of where you are in all aspects of your life, and will really help manage your way towards your goals. It does NOT have tasks on it that have a definite deadline to them – as these should be immediately added to your diary instead. It is NOT a complete brain dump of everything you would ideally like to get done at some point in the future – as this gets too overwhelming to say the least. 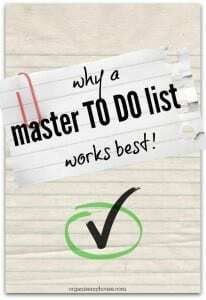 WHAT ARE THE BENEFITS OF A MASTER TO DO LIST? I am totally in love with my MASTER TO DO LIST, because it really helps me to have everything in one place that’s important and a priority to my life at that moment. I find that having everything in one place makes it so much easier to progress tasks, whatever you are doing, and so much easier to see what I have to get done at some point. I can prioritise more effectively and focus more easily as the list is split up into categories. The main thing that stays the same though is that I am only one person, so it stands to reason that every different role I play in my life (mum, business woman, home keeper, wife, friend etc…) has to fit into my time and therefore tasks related to any part of that life should be on one list and one list only – which is why categories work so well on the list. Another amazing benefit of this list is that it really helps me to guide my life and my goals – because I always think that your TO DO list should, at least to some level, reflect your goals. Think about it, if your TO DO list is only full of things that get you by each week, then you will feel less fulfilled than having larger tasks on it as well that lead you eventually to something you really want to do (start a business, redecorate a room etc…). It helps that I can see clearly what I’ve written down, and therefore what I’m heading for should I get it all done (its sort of a reflection of your life and what you see yourself doing, so it should at least to some degree get you excited when you look at it!). Writing everything down also means that I can change as my life and goals change and other things become more important (for example, I may have a TO DO as being to sort out all the baby clothes my daughter has outgrown, and sell them online – but what if I become pregnant again. Obviously I don’t now need to sort the clothes as I will need them again in the future, and so my MASTER TO DO LIST changes at this point to reflect that change). If I didn’t have TO DOs written clearly then I may not feel as in control as I do when I write everything down and see where I am headed. I can scan that list at any point and see that goals I have set for any area of life at that point are going to be tackled – with definite tasks written out that will take me one step closer to each one. I know that I will get there in the end, no matter how long that will take (depending on how much time I can give my TO DOs each day/week/month). WHERE SHOULD I KEEP A MASTER TO DO LIST? This, as always when it comes to getting organised, is totally up to you! I am a paper and pen kind of girl when it comes to lists and my diary, and I also work from home most days, so at this stage of my life I keep my list in my Home File. This works for me because my Home File is easy to grab and it’s also easy for my hubby to see if he should need to at any point. TIP – If you have a MASTER TO DO LIST in your HOME FILE then you may decide that you want to add in everyones tasks to the list. This can work really well when you and your partner (for example) are completing a project around the house together and want to split up the tasks easily. When I was out of my house more during the day, I decided that the best place for it was actually at the end of my Diary, which works well as well – so it depends on how I am feeling and what life is like really! My husband has his master TO DO list on his phone in a TO DO list app – and this works best for him. So, whether you are a paper and pen enthusiast like me, or prefer a technology based solution – it doesn’t really matter. The thing that matters is the system that you have in place for your TO DO list so that it works hard for you and you control it rather than it becoming an overwhelming beast thats unworkable. Previous Post: « TOP 10 MOTIVATIONAL QUOTES – BE INSPIRED! Thank you so much! I am also a list person, they do however get lost on occasion. I am going to do this one right now! Great inspiration! No problem at all Rachael – glad you found what you were looking for!